A pair of Langley boys are helping battle cancer one event at a time. This weekend is Gone Country. Jul. 18, 2017 6:00 p.m. Normally a happy-go-lucky kinda guy, Chris Ruscheinski will be “devastated” if this weekend’s Gone Country – Here for the Cure cancer fundraiser doesn’t generate enough coin. 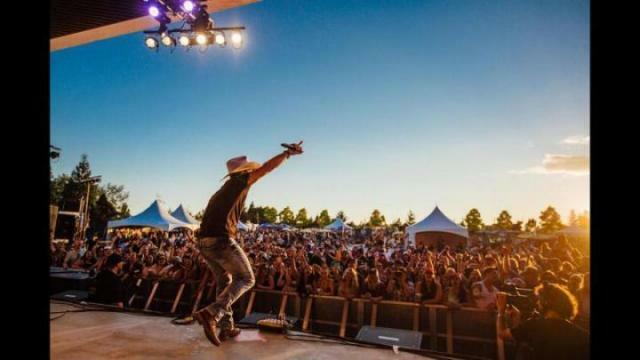 “I’m going to be a BIG pouty baby for days if we don’t do $400,000,” he told the Langley Advance Tuesday, just hours ahead of selling out a huge outdoor charity concert happening in Cloverdale this Saturday. Actually, the goal for this day-long country music extravaganza is to raise $366,000 – that’s double what Langley’s Chris and Jamie Ruscheinski raised five years ago, when the brothers first started Gone Country. The twins began their campaign to fight cancer in earnest after their mother passed away and after losing their close friend Shaun Gauthier to cancer five years ago. To date they have raised more than $1.8 million for agencies such as the BC Cancer Foundation and now Canuck Place. Chris is insistent this year’s goal is not only achievable, he’s convinced they can well surpass it – personally shooting to top $400,000. “My brother just hates it when I go off on my own like this,” said Chris, convinced that between all the ticket sales, VIP tables sales, sponsorships, and on-scene fundraising initiatives, his target can be hit. Canuck Place will be the biggest benefactor of this year’s concert – for the second year running. This time out, Gone Country money is earmarked specifically to furnishing and outfitting four bedrooms with necessary medical equipment within the children’s hospice care facility in Abbotsford, Chris said. In addition to the money being raised for the one specific charity, some money is also expected to go to Lower Mainland families dealing with their own cancer crises. Each year, the Ruscheinski brothers are approached by countless individuals or small groups asking for financial help for a loved-one battling cancer – someone in need of a financial boost, Chris explained. While it’s impossible to say “yes” to each of these requests, the boys came up with a way for the seekers to help, benefiting from the successes and popularity of Gone Country. It’s called the Raise It For Your Cause project, and if approved, loved ones can sell tickets to Gone Country. Once the tickets are sold and the amounts tallied, then “every penny” raised is donated back to the designated beneficiary. “It’s a win-win,” Chris said. “Canuck Place is obviously a very special charity to us. But in our hearts, we really want to be helping families in our community and this is a way we’ve found that we can help others,” he said. “We know first hand the financial beating that a family can take after that awful diagnosis,” Chris added, explaining that their first charity concert many years ago (when they were 17) helped raise $1,000 to help their own mother, who was financially strapped and battling cancer. Since they started the Raise It For Your Cause program, in connection with Gone Country, more than $40,000 has been donated back to families suffering financially from the fight against cancer. This year, for instance, one person has already sold 120 tickets, raising close to $6,000 for their loved-one. “This year will mark our fifth Gone Country and our 17th year of fundraising to fight cancer. We have never taken a penny and never will – something we know our mom would be proud of,” said Jamie, who’s credited with the initial idea of throwing a country concert. This year’s Gone Country event features country music star Tim Hicks, as well as JoJo Mason, Danielle Marie and two Langley acts, Karen Lee Batten and Me And Mae (Shawn Meehan). Dave Hartney and JRfm’s DJ Jaxon Hawks will make sure the music keeps going on stage two – between the big acts. The Gone Country fundraiser to fight cancer runs 2 to 11 p.m. on Saturday, July 22, at Millennium Park (64th Avenue and 176th Street, in Cloverdale). It is an event for people 19 years and older. If there are any more tickets, they’re available online. Tickets are $46.99. Chris said there were 15 left to go, and he was expecting to reach their 5,000 person goal before the end of Tuesday night. Last year’s event attracted roughly 4,200 people.